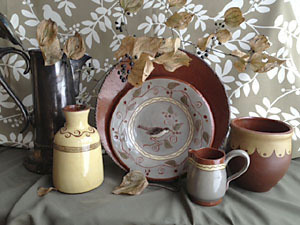 Real American Made earthenware pottery inspired by early redware from Colonial America and Europe. Antique textiles provide design inspiration for many of the floral pieces. Pamela Armbrust using the same techniques as those used by early redware potters. Plates and platters are rolled out, cut and draped. Decoration is achieved using a combination of slip trailing, sgraffito, and slip brushing. 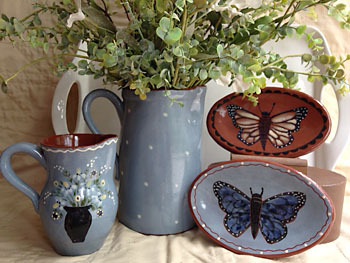 Pitchers and jars are wheel thrown and decorated in the same manner. All pieces are glazed with a transparent amber glaze and fired to approximately 2000 degrees. All glazes are food safe. The matte or 'aged' finish is a process achieved after firing to give the piece a more 'primitive' look. 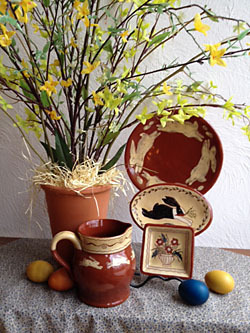 Red Oaks Pottery can be found in stores and museums across the United States and abroad. Please look thru the images in our Gallery of Redware.